Runners know that running season waits for no one. Anyone who hits the pavement year round knows the importance of a good pair of running gloves to shield the hands against harsh cold and snow. 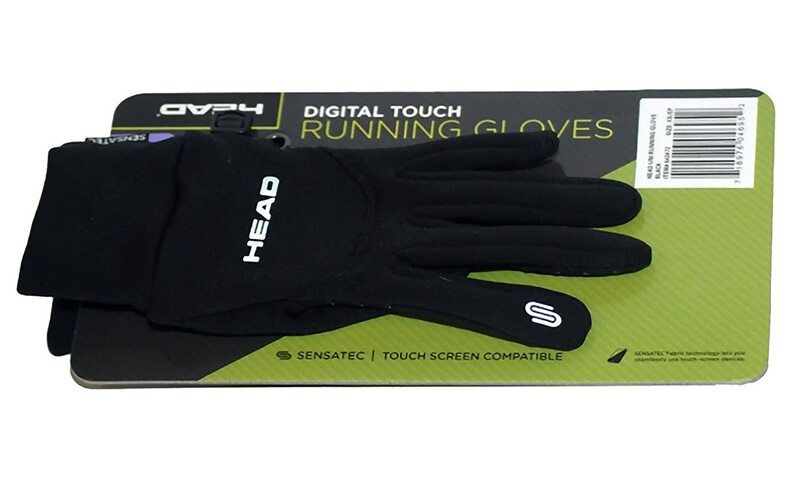 Running gloves provide grip, visibility and insulation for runners in even the coldest climate. Keep your fingers from getting frosty with one of our top picks of winter running gloves. Nike’s thermal running gloves provide comfortable warmth in cold conditions, allowing you to heed their slogan – “Just Do It” – even in the coldest winter months. They are machine washable for easy maintenance and feature a nifty key pocket to stash your house key when you hit the road. Suited for temperatures below freezing, these gloves will ensure that you don’t have to cut a run short due to icy fingers. While reviewers reported varying temperatures, the gloves are made to be resistant to temperatures as low as 20 degrees Fahrenheit. One user said that his hands stayed warm in extreme low temperatures as cold as 7°F, although most said they are best suited to 20°F and higher. On the plus side, these gloves are thin enough to be worn as a base layer underneath heavier gloves if you have especially cold hands or live in an area that regularly drops below 20°F. Patented Therma-FIT fabric keeps hands warm and dry during even the most strenuous winter runs while moisture wicking fabric keeps your fingers dry to eliminate chill. The palms of these gloves are outfitted with insulated fleece and mesh for an ideal balance of warmth and breathability. 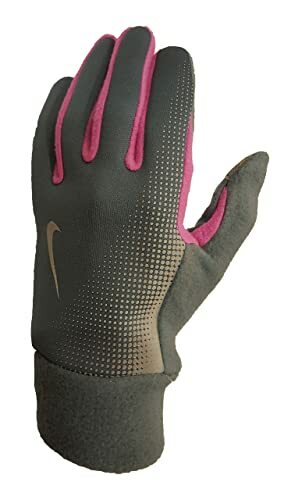 Nike claims that these gloves were specifically designed to conform to body heat patterns for warmth where you need it and breathability where you don’t. Four colors are currently available on Amazon: Black/Anthracite (deep charcoal gray), Black/Red, Gray/Blue and Gray/Pink. Each color is embellished with the iconic Nike “swoop” and high contrast graphics for enhanced visibility. Sizes are available from Small to X-Large. Based on Amazon’s sizing reviews, 89% of customers reported that these ran true to size and fit as expected. A few users said that they ran somewhat large, but overall reviewers were happy with the fit. The cuffs fit snugly to prevent heat from escaping, a feature many users found very helpful. If you need to change your tunes mid-run, fear not: you won’t have to remove your gloves to use your touchscreen devices. The conductive thumbs are touchscreen compatible so you can skip and go. The rest of the fingers are not touchscreen compatible, but most users didn’t find that to be a problem as they use their thumbs for touchscreen anyway. As another added convenience, a small key pocket is included on the palm of the gloves. It’s just large enough to stash away a single house key so you can lock up before you go. Although these gloves are no longer manufactured by Nike, they are available from a number of sellers on Amazon. Amazon’s pricing is currently at $22.46 with limited sizes available. Additional sizes are available from third-party sellers for around $35 per pair. These gloves received an overall 4.4 star rating on Amazon with 85% of reviewers rating them 4 stars or higher. The title of the top-rated review says it all – it simply states “I wear these running in Minnesota in January.” If they’re warm enough for mid-January Minnesota, they’re warm enough for almost anywhere. Trailheads has combined ultimate dexterity with comfortable warmth for a running glove that is versatile and practical. Although they are lightweight, they provide a surprising amount of warmth by wrapping tightly around the hand to keep heat in. When they need to be cleaned, just throw them in your washing machine and let air dry. It is important to note that these particular gloves are not meant for winter’s coldest days. Instead, they can be used to hold in the heat naturally produced by your body to keep hands warm in weather around 35°F. For particularly bitter days, it’s recommended to layer these under a thicker pair of gloves or mittens. Luckily the thin, lightweight design of the Elements gloves is perfect for layering. For ultimate dexterity, these gloves are made with 4-way stretch fabric to provide form-fitting but flexible protection. Made with a blend of polyester, nylon and spandex, they wick away moisture and trap in heat to keep your hands warm and dry. The fabric in between fingers is made with closed cell mesh to allow airflow without sacrificing warmth. Three colors are available from the manufacturer’s website. Choose from Black/Gray, Black/Hi-Vis Yellow, or Black/Pink. Amazon currently does not carry the Black/Pink, but the other colors are available. Each color is predominantly black with colored accents between the fingers and across the back of the hand. The Trailheads Elements gloves come in Small, Medium and Large. For the most part, users reported that they run true to size. A sizing guide is available on the manufacturer’s website. Several users noted that although the gloves themselves fit well, they are just short enough to create a gap between the gloves and a shirt sleeve, which leaves wrists vulnerable to the cold. These gloves are not currently touchscreen compatible, although Trailheads claims to be redesigning them with touchscreen compatibility in mind. At $20, these gloves are an affordable and lightweight option for mid-temperature winter runs. Most users loved that they provide ample warmth without ever leaving hands overheated. Overall, the Trailheads Elements gloves earned a 4.3 star rating on Amazon, with 84% of reviewers rating them 4 stars or higher. 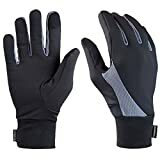 Those who left critical reviews typically did not realize that these gloves are designed specifically to wear while running and will not provide ample warmth when idle. These gloves are meant to hold in your natural body heat without overheating. Designed with the cold weather athlete in mind, these multi-sport gloves from Head provide substantial warmth without the bulkiness of many of its competitors. While a few commenters reported that these gloves weren’t warm enough, the majority said that they provided the perfect amount of warmth without ever making their hands too hot. Regular winter gloves are often too warm for running, as your body naturally exerts heat when you exert yourself. Many runners prefer a running glove that starts out as somewhat cool and warms up throughout their run. These gloves fit the bill, with most reviewers reporting positive results in weather as cold as 25°F. A unique silicone palm design provides excellent grip, which is handy for gripping a steering wheel or working outside with a shovel. One reviewer, an avid tennis player, says that this additional grip has made it much easier for her to hold her tennis racket in cold weather matches. It is important to note that these gloves are not waterproof or weatherproof. They are made to protect the hands from cold and wind, but excessive moisture can make its way through the fabric. Stick with a pair of waterproof gloves for rainy days, or layer these underneath your favorite waterproof gloves for extra warmth. The overall design of these gloves is lightweight and sleek. They provide adequate warmth without bulk, and most users said they were able to easily fold them up and stash away in their pockets or purses when needed. They are thin enough to be layered underneath heavier gloves for double-duty warmth on extremely cold days. Head’s multi-sport gloves come in Black or Heather Gray. Each color is embellished with a reflective “Head” logo on the back as well as a small design on the back of the index finger to indicate the touchscreen compatible finger. These reflective surfaces are great for early morning or late night runs, as they will increase visibility for passing cars. Since these logos are fairly small, make sure to add some other reflective surfaces to your outfit if you’re planning a run in the dark. Sizes are available from X-small to X-large. 88% of users reported that they run true to size, although a few recommended sizing up if you’re unsure. Sizing on these gloves is unisex, so males especially should opt for the larger size. The cuff is extended and fits snugly to cover more of the wrist than many other gloves. Head’s “Sensatec” technology allows you to use your touchscreen device with both your thumb and index finger. Users found that the conductive tips were accurate and made it easy to text or skip tunes during their run. As these are available on Amazon from third-party sellers only, their pricing is fairly inconsistent and depends on the size you select. The X-small are available for a mere $4.99, while the X-large cost $23.92. Even at just over $20, these gloves are still much more affordable than many of their competitors. 82% of Amazon reviewers rated these gloves 4 stars or higher for an overall 4.4 star rating. Beth Knotts, managing editor at Tool Skool, loves these gloves for their lightweight warmth and flexibility. For the athlete on a budget, HighLoong’s lightweight running gloves provide protection in mild to moderate cold. 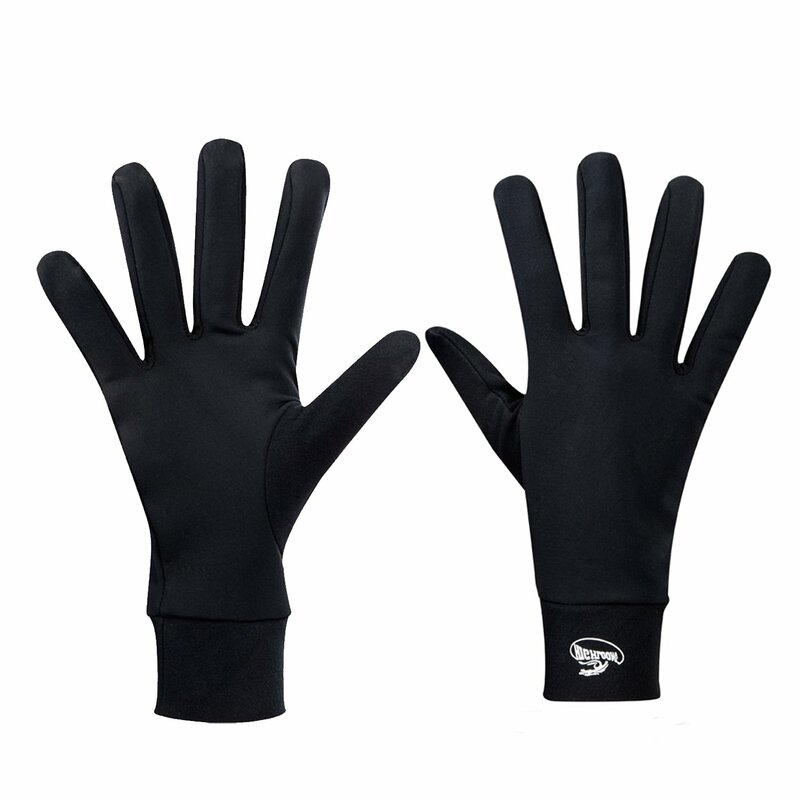 Best suited for spring, autumn and early winter, these gloves are not intended to be used in extreme cold. They are made with lightweight 4-way stretch fabric for maximum comfort and breathability. Flexible compression holds in your natural body heat without sacrificing dexterity. If you’re looking for something to keep your hands warm and dry around 40°F, these gloves can do the work of their much pricier competitors. Moisture wicking material on the inside of the gloves absorbs sweat to prevent accumulation and odor. The thumbs are made with a super fine fleece while the rest is made from 88% polyester and 12% spandex. This polyester/spandex combination provides maximum flexibility in a snug, secure fit. The cuffs are double layered and extended to cover the wrists. Available in black only, these gloves are simply and sleekly designed. The only embellishment is a small white HighLoong logo on the back side of the cuff. Unlike the other gloves on our list, it does not have any reflective materials for enhanced visibility, so be sure to wear another reflective surface if you run in the dark. These gloves are available in limited sizes from Small to Large. HighLoong claims that since their fabric is extremely flexible, these gloves will stretch to fit almost any hand size. Sizing is unisex – generally, they recommend the small for women and medium-large sizes for men. Unfortunately HighLoong’s compression gloves are not touchscreen compatible. If you’re willing to sacrifice this convenience for a steep discount, this is a fairly minor setback. For the “set it and forget it” music listener, the lack of touchscreen compatibility is worth the extremely low price. While they regularly retail for $29.99, Amazon offers these gloves at a deep discount for only $8.99 for a savings of 70%. Their lightweight, practical design provides warmth that is comparable to many higher-end running gloves at an unbeatable price. Although there is a fairly limited amount of reviews available on Amazon, those who have left their comments reported very positive results. Every person who left a rating left 4 stars or higher for an impressive overall rating of 4.9 stars. However, it is important to note that this rating is reflective of a very limited amount of reviews as compared to the other gloves on our list. It goes without saying that the single most important function of running gloves is to provide warmth and protection in cold weather. That being said, running gloves are not “one size fits all” in terms of temperature. Runners who live in moderate climates will not need the same gloves as a runner living in New England or any other severely cold climate. If you live in an area that rarely dips below 40°F, a thin, lightweight pair of running gloves will keep your hands plenty warm and dry. But if your winters typically fall below freezing or into the single digits, you’ll want to opt for a heavier duty pair of gloves. Alternatively, you can select a thin pair for regular use in mildly cold weather and layer up when temperatures drop. A glove made of the right materials is essential if you want to maximize comfort and warmth on your run. Most commonly, running gloves are made of polyester, acrylic, fleece, polypropylene or a combination of these. Each fabric has its own benefits and limitations. Polyester is a great moisture wicker with great breathability, meaning your hands will stay relatively sweat-free and dry. However, it’s not known for being weatherproof and is better suited for relatively dry days. Acrylic offers many of the same benefits as polyester but without some of the moisture wicking. Fleece is typically used in conjunction with one of the aforementioned fabrics to provide a combination of warmth, comfort and moisture wicking. While it is not meant to enhance breathability, fleece is excellent for providing warmth. If you run in a climate that is often rainy and wet, a glove made from polypropylene will protect you from wind and water to keep your hands dry. However, it’s not quite as breathable as its lighter counterparts. Many running gloves have reflective elements on them to increase visibility for early morning and late night runs. This is especially important in winter when days are shorter and you’re more likely to be running in low light. Even if your gloves have a lot of reflective designs, it’s still advisable to wear other apparel with reflective surfaces – whether it’s shoes, a hat, or a shirt. Experts also recommend wearing a headlamp or other source of bright light to enhance visibility. The more visible you are to cars, the safer you’ll be on your runs. While minimalists might find them unnecessary, extra features like key pockets and touchscreen compatibility have become a big selling point in athletic gloves. Having a pocket for your house key might be a convenience you didn’t know you needed until you had it – no more sticking your key under the doormat before your run. If you, like most of the world, are plugged into your smartphone at all times, having touchscreen compatibility can be a great convenience. With conductive fingertips, whipping your gloves off mid-run to change a song can be a thing of the past. Nike tops our list with their Thermal Running Gloves, complete with moisture wicking Therma-Fit fabric and insulated fleece for your most comfortable winter run. 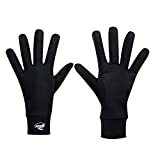 Whether worn on their own or as a base layer with a heavier pair of gloves, users said that these gloves were suitable for a wide range of temperatures. As an added bonus, they’ve got a key pocket to stash your house key and are touchscreen compatible with all devices, so you won’t get stuck on that annoying Katy Perry song again. Versatility, superior warmth and solid user ratings landed Nike’s Thermal gloves at the top of our list as Gold Pick.